Here in the United States, federal judge Brett Kavanaugh was just sworn in as a Supreme Court Justice after a very contentious confirmation process. Unlike many politicians and \ political appointees, Justice Kavanaugh did not own his exact match BrettKavanaugh.com domain name. Surprisingly, it looks like BrettKavanaugh.com was created in September of 2015 – just three short years ago. The domain name is currently registered under Whois privacy, so the registrant is not known. From what I can tell using the Whois History tool at DomainTools, it looks like the domain name has been privately registered since 2015. 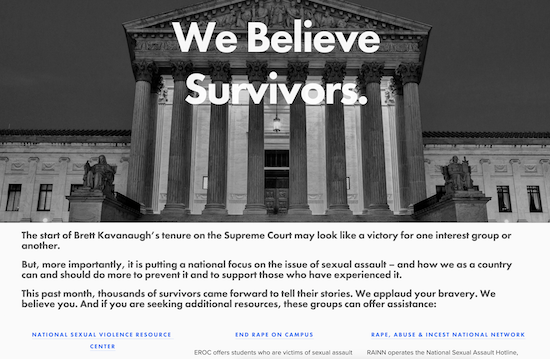 The headline on the landing page is “We Believe Survivors.” There are some words shared about the confirmation process and how the issue of sexual assault came to the forefront of the public discourse. Finally, there are links to organizations that assist survivors of sexual assault. I presume this website will continue to operate during Justice Kavanaugh’s tenure on the Supreme Court. I will refrain from sharing any political viewpoints on this topic, but I do think this highlights the value of a first and last name .com domain name. I am sure there are and were special interest groups who would love to own BrettKavanaugh.com, and there was a whole lot of money spent fighting for and against his confirmation to Supreme Court Justice. From my non-legal perspective, the usage of BrettKavanaugh.com seems to be perfectly within the registrant’s First Amendment rights. Politicians, political appointees, celebrities, or others with aspirations of being a public figure should do what it takes to secure their domain name. There is considerable value in these types of domain names, especially if the person becomes the topic of heated public debate. The site says “We Believe Survivors” which is correct, they should be believed. But in this instance, I don’t think they could find a single witness that could even confirm they knew each other.